I have to stay that Porto was a great surprise. It clearly exceeded my expectations. The landscapes are stunning, the people are extremely friendly, the prices are very low, the weather is warm and sunny, and the food/wine are delicious. I stayed only for 2 nights/3 days, but I would like to go again. One more time I would recommend to do one of the free walking tours, where you would visit items 1 to 9. You will also get a historical background of all the places, some funny/mysterious myths/stories and various recommendations from locals. We did the tour with Pancho. It takes 2.5 hours, normally from 10 am to 11.30 am. We choose the Historical one, but there is also one called Cultural and Artistic. In the Clerigos Tower, you can go up (no during the walking tour) and have a beautiful view of the city. The church itself is free, and you can pay €3 to climb 240 steps and get to the top (75.6 meters). 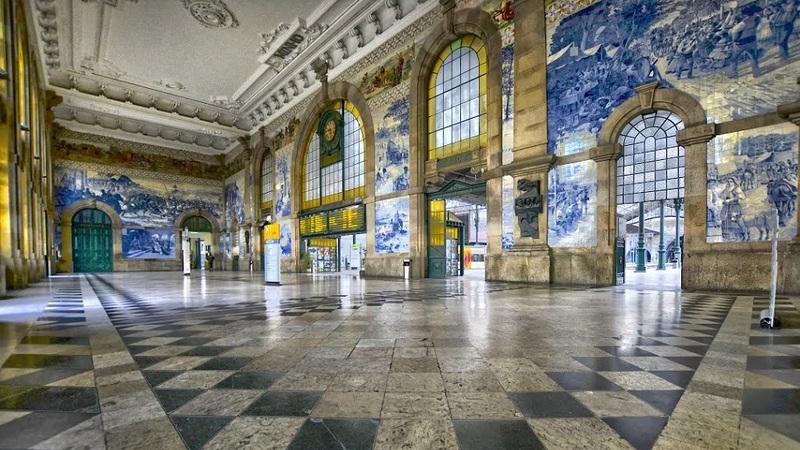 Sao Bento Train Station‘s walls (in the main hall) are decorated with 20.000 tiles depicting the history of Portugal, impressive! It should be in the top 10-20 most beautiful stations in the world. And it is only 10 minutes away from the Cathedral and the Clerigos Tower. Livraria Lello & Irmão (also knows as Lello Bookstore) is “Harry Potter’s” famous library. Rumours indicate that its stairs inspired Hogwarts stairs in the book. It sounds reasonable given that JK Rowling spent some time teaching English in Porto. 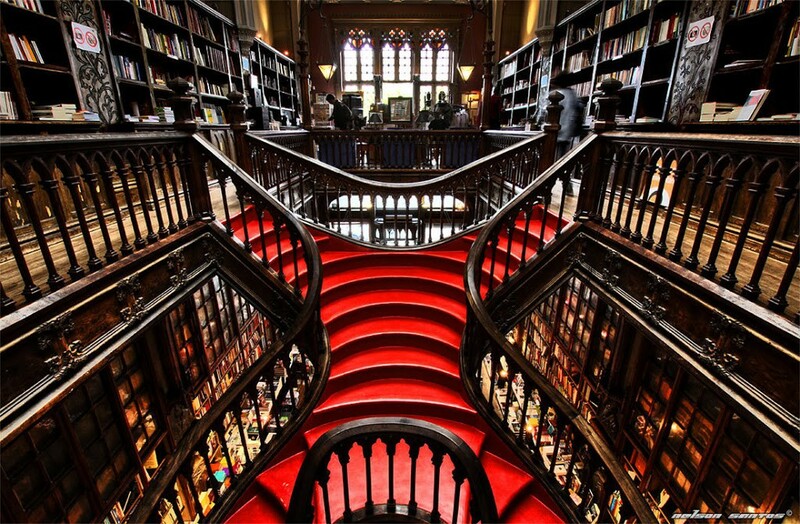 It is frequently rated among the top 10 bookstores in the world. It is a must with no doubt, the downside is that may need to queue to enter. Casa da Música is also outside de city centre. It is a major music venue and an iconic building designed by a Dutch architect. Its main three orchestras are Orquestra Nacional do Porto, Orquestra Barroca, and Remix Ensemble. Ponte Luis I is also a must. Two friends teased me for a long time because I told them “This morning I found peace”. To which they asked me: “Where?”. And I replied: “There, just by the river on the south side”. The first picture of the post is from that moment. I went there in the morning, the weather was great, not too warm, just the right temperature for shorts and a t-shirt. I bought a Super Bock (beer) and I sit on the rocks, facing the river and the bridge. This part of the river is quiet and relaxing. You can see the northern part where most of the people go. Looking at the water and the crowd far away makes you feel good. Those boats were colourful and complemented the landscape to perfection. A few streets stalls selling traditional stuff added even more to the picture. If you find yourself enjoying something as simple as this, just on your own and in the first time you visit the place, you can undoubtedly confirm that the trip was worth it and you will remember that moment. I then walked by the river until I got to the bridge “Ponte da Arrábida”. Very nice view, almost no tourists and a lot of locals working out and fishing. I then crossed it and went to Serralves Foundation. It was not that easy to take the bridge (there was an elevator but it was broken), and the bridge is actually a very busy road (A1). But the view from it was pretty and it was also the faster way to get back to the north. I really enjoyed this walk and I totally recommend it. Probably most of the blogs recommend staying in the city centre, which is between the Ribeira (riverside) district and the central “Avenida dos Aliados”. This is very practical because all the main attractions are nearby. However; I would recommend staying some meters West from the avenue. You will avoid the crowd and feel more local. I stayed in a hostel this time: Pilot Design Hostel & Bar. It is only a 6-minute walk from Aliados Metro Station. It was cheap and friendly and had a nice terrace. There is a good hotel called Eurostars Das Artes, if you are looking for better quality (4 starts). And if you want a bit of luxury you should stay at The Yeatman, where you can also find its Michelin star restaurant. My friends stayed in Ibis Centro. I think Ibis hotels are always a good and modest option. They are generally close to city centres, airports or railway stations and offer low rates. Port wine. This is the most prestigious and well-known product of Porto. The grapes are cultivated in the Duoro Valley region of Portugal. It is a sweet and fortified red wine usually served as a dessert. Francesinha. This is the second most notorious local product. It is made with bread, wet-cured ham, linguiça, fresh sausage, steak or roast meat and covered with melted cheese and a hot thick tomato and beer sauce served with french fries [wikipedia]. Vinho Verde (green wine). This wine is originated in Minho province and not in Porto, but it is a very traditional Portuguese product. It translates to green wine but it really means young wine. It is slightly fizzy and normally served cold. Pastel de nata. The most famous pastry in the country, which is filled with egg custard and baked. Cod and Sardines. These two are the winners of Porto’s seafood. There is an iconic place that claims to be the king of the grilled sardine (“Rei Da Sardinha Assada“). Requeijão com doce de abóbora. A very original combination consisting of ricotta with pumpkin jam usually served for breakfast or dessert. Super Bock. The beer of the city. There is a strange dispute between this brand and Sagres from the Lisbon. Locals are proud of it. 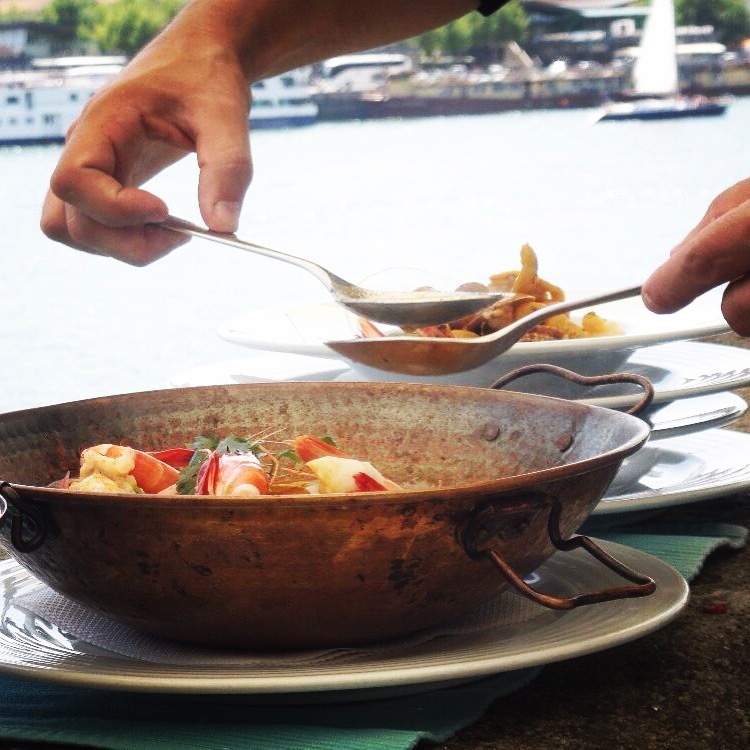 Ribeira is the favourite place to go for lunch/dinner. Having the river on sight is always a plus. It is also the most expensive area, but it is worth it. 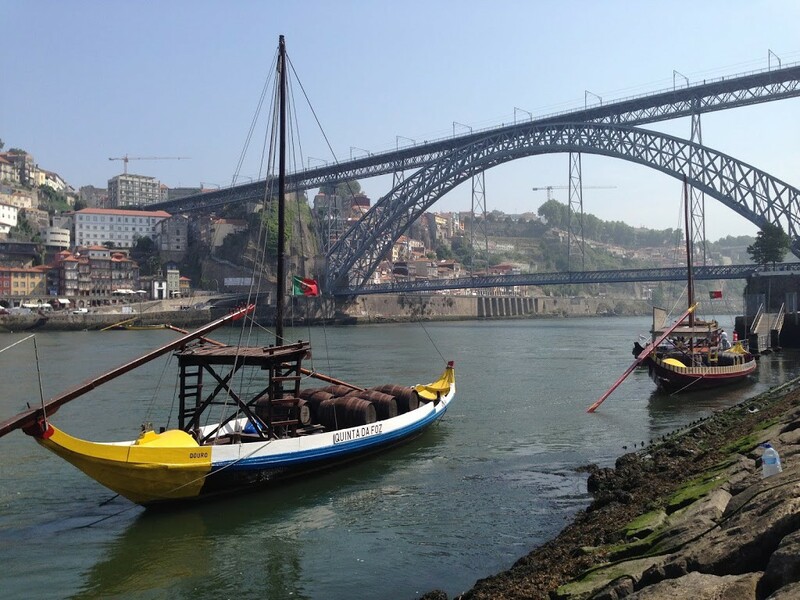 Having fresh seafood and a good wine by the river is a must in Porto. One place I recommend is Fish Fixe. We had a beautifully cooked seafood casserole (picture below). Very good service and a variety of fish and wines. 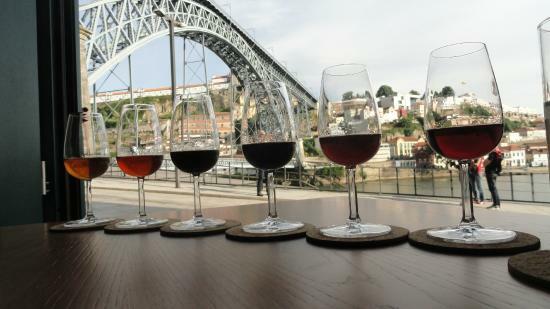 Bacchus Vini is a great option to taste Porto’s famous wine. The location is brilliant, as you can see in the picture below. You can enjoy a good variety of wines (10, 20, 30, 40 years aged and more) and visit the cellar downstairs. Prices are reasonable and the staff knowledgeable. They also have good cheese platters and olives. 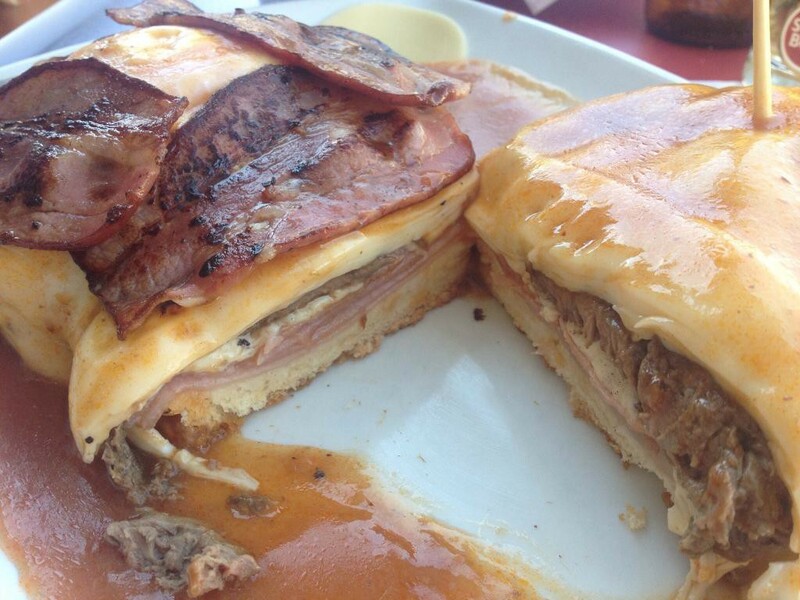 Santa Francesinha is the place to get….. Francesinha, or course. It can get very crowded, but it will worth the wait. There are also some good spots in Praça de Parada Leitão, which is just next to the University of Porto. It is a pedestrians-only street. And around the corner (Campo Mártires Da Pátria) you can find more, next to Hotel Caldeira and Wine Hostel. 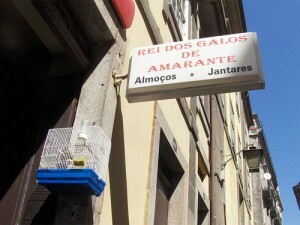 Buy my favourite place by far was Rei dos Galos de Amarante (Rua das Taipas 121, tel: 222057297). 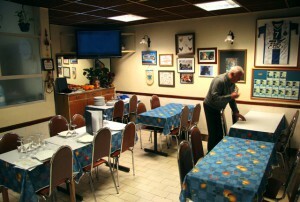 It is a tiny, cosy, cheap and traditional family run restaurant. If you like this kind of places, you are going to love it. Its owners (Rodrigo and Maria Rosa) will serve the food themselves. The menu is very limited, but everything is extremely tasty and homemade. I had an amazing roasted chicken with potatoes and broccoli. I could not try their speciality: “Arroz de Cabidela” (homebred stewed chicken with rice, seasoned with blood and vinegar) because you need to book in advance for this. If you have time you should do it. Most of their food comes from their own farm. Lastly, I would like to mention Flor dos Congregados. It is one of the local’s favourites and highly recommended as well. It is a 162 years old traditional restaurant, well known for a slow cooked pork and ham sandwich called Terylene, which takes 24 hours to prepare. You can find more info and places in this post. There are a couple of streets that concentrate most of the pubs and coffee shops: Galeria de Paris and R. de Cândido dos Reis. All the locals hang out around there, drinking inside and outside the pubs. It gets very crowded, but it is fun. Some good spots are Cafe Au Lait, The Wall Bar and Plano B, which is also a club. But because I like hipster/cool/less-posh/alternative and beer-oriented places I would recommend a different area. There are some good spots on Rua das Oliveiras, my favourite was Aduela taverna/bar on number 36. You can then go to the trendiest area around Rua Miguel Bombarda. You will find artistic places such as Galeria Presença; cool pubs such as Casa-de-Ló; a spiritual tea house called Rota do Chá; and a very sophisticated hotel called Casa do Conto. Finally, if you are interested in electronic music and the underground scene, the club you do not want to miss is Gare Porto (R. da Madeira 182; opens 23:59 – 07:00). They normally have good DJ’s playing on Saturdays. There is also a great pub in front of the club, in the same building as the station. You can even see the rails from the tables. Very cool and original, ideal to go before partying. Last but not least, I would strongly recommend visiting the beautiful Douro Valley, land of wine, sun and great landscapes.